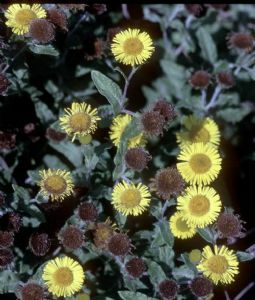 Pulicaria dysenterica. This wild flower looks like Van Gogh's sunflowers in miniature! Growing just one or two feet high in the late summer and autumn, it attracts butterflies less common in gardens, like the Small Copper and Common Blue. It prefers damp conditions, and spreads into a good clump in one year. Hardy Perennial. Plants and seed currently available. See Pond and Bog plants section for plants.